Their military uniforms were handmade from sewing patterns, their firearms made from musket kits and their inspiration from a sense of hometown history. The reactivated New Marblehead Militia was born during the lead-up to America’s bicentennial year of 1976. It began as a casual remark made by one teacher to another over lunch at Windham High School early in 1975. He did. And Windham’s New Marblehead Militia, complete with color guard and fife & drum, was marching in parades, re-enacting colonial style military battles and performing commemorative salutes at veteran gravesites in time for the United States’ 200th birthday on July 4, 1976. 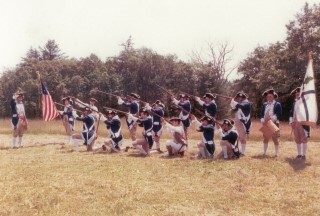 Although well-known and popular in Windham, where it originated, the militia performed throughout New England from 1976 through the 1980s, re-enacting the major battles of the Revolutionary War. The New Marblehead Militia was the resurrection of an earlier call-to-arms when one of Windham’s (then known as New Marblehead) early founders, Richard Mayberry, responded to Gen. George Washington’s call for able-bodied patriots to defend the colonies against British tyranny. “Mayberry’s Company,” made up of local farmers and merchants, would become the fifth Company of the 11th Massachusetts Regiment and would serve at Valley Forge during the winter of 1777-78. Millett’s revived militia of 1976 was comprised of several dozen volunteers from Windham and other Lake Region towns. Authenticity became the watchword. Period muskets were produced. “There were three types,” according to Millett. The British Brown & Bess musket ironically provided to colonists earlier by the British in the defense against Indians and the French. Another type was the French Charlieville. Both were smooth-bore flintlock muskets used in close quarter battles. The third, known as the Pennsylvania long rifle (or Kentucky squirrel gun), was of German origin and made by colonial gunsmiths. Its rifled barrel was useful for distant shooting. Each volunteer in Millett’s militia chose his own preferred type of firearm. Millett ordered the gun kits in bulk and taught an adult education course in their construction. The uniforms, handmade by family members of the volunteers, were eye-catching, especially those of the Continental line (regulars) and fife & drum units. The Continental soldiers sported field-color blue coats with white button-down fronts. The shirts, ruffled collars and sleeves and knee-length trousers were shiny white. The fife and drum unit, comprised of eight to 12 junior and senior high school students, led the marching militia in three-pointed tricorn hats and equally colorful shirts and vests. Millett credits individual and business donations for the financial support of the militia during its 15-plus year run. He said, during its heyday, the New Marblehead Militia volunteers numbered between 25 and 30 members and would often split into multiple contingents for simultaneous appearances around New England. Militia volunteer Bill Hager of Windham recalls one particularly exciting re-enactment in Rhode Island. It was a recreation of the Battle of Aquidneck Island, one of the largest battles of the Revolution, and considered one of the most significant shows of resistance by the Continental forces (1779). “We were firing cannon from shore at a sailing force of British square-rigged schooners. Quite loud and very spectacular.” The battle cost the British one of its few strongholds on the Continent at the time. Hager added the huge reenactment drew thousands of spectators, who watched scores of militia units totaling an estimated 2200 reenactors from all over New England. 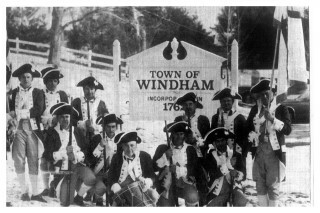 The Windham militia was a popular and welcome presence at parades. They were in heavy demand at area Founders, Old Home and Memorial Day parades. The fife and drum would herald the militia’s approach; a color guard promenaded the U.S., the state of Maine and the fifth company flags – the latter portraying a green pine tree and blue cross on a field of white. The minutemen and Continental line followed. The captain, flanking the marching men, would shout the commands for cadence, “Hut-2, hut-2. And occasionally, “Left shoulder, arms” or right shoulder, arms” (because the muzzle loaders, weighing up to 8 or 9 pounds, would begin to feel too heavy on the same shoulder). One self-proclaimed and solemn duty of the New Marblehead Militia was to honor their forebears. The blue-uniformed Continental line visited the grave sites of each member of “Mayberry’s Company” and fired off an honor salute (pictured here). The New Marblehead Militia no longer graces our parades and special events. But Millett says that 6 to 10 of the members gather once a year for a pot luck supper to remember the glory days and to view, once again, the 5th Company flag and the uniforms.